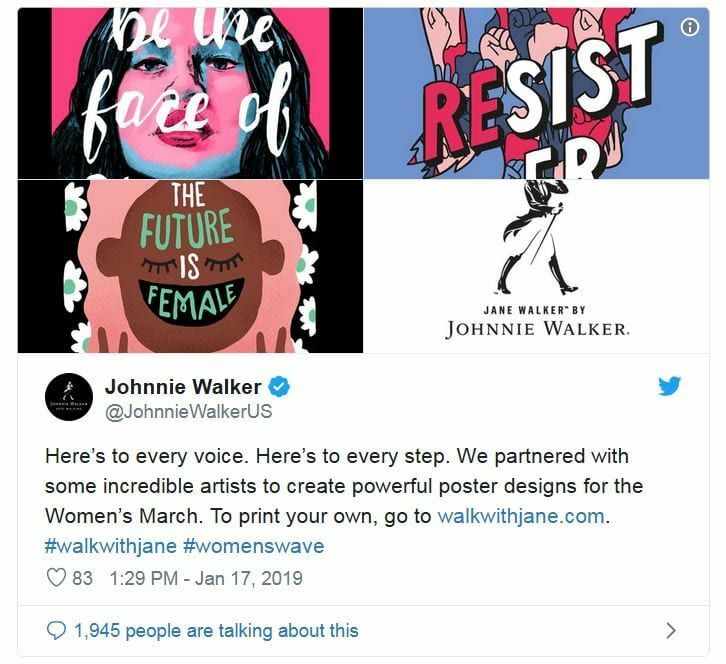 THE LATEST CORPORATE SOCIAL FIASCO: JOHNNIE WALKER STEPPING ON A RAKE FOR THE WOMEN’S MARCH. Johnnie Walker has come out in support of The Women’s March, and it is not going well. The scotch brand has been an enthusiastic backer of the movement, seemingly oblivious to the various groups that have disavowed the March due to anti-semitic leadership. To date the NOW, NAACP, Greenpeace, Emily’s List, and the Southern Poverty Law Center are just a few who marched off. Things have become so toxic even the Democratic National Committee has cut ties. But the scotch mavens are touting its affiliation with the hate-filled group, even partnering with them on a marketing basis. On the eve of the March Johnnie Walker tweeted out this collection of posters it commissioned for the event. The wisdom behind a company clearly choosing sides (note the “Resist” poster selection) is obscured partially by lending support to an organization many are fleeing due to its internal anti-semitic positions. Johnnie Walker may have signaled itself into a corner, as the brand has been an active booster for the movement for at least a year now. But as with Gillette, not this week.